We regret to inform you that Ennuel has been denied entry to the US so he will not be able to come for this weekend. Refunds WILL be issues (please give us time). We are happy to welcome Ennuel Iversion for Valentines Weekend 2016! This will be Ennuel's first visit to Seattle so let's give a warm hug and welcome!. An international artist, choreographer and one of the more prominent Urban Kiz dancers, he comes to us from France. General Workshops will be held on Saturday Feb. 13th and small group sessions on Sunday Feb 14th. We'll also be planning Saturday night party somewhere (stay tuned!) See the details below and scroll down to register. 4:45 - 5:00 Wrap-up, Pictures, etc. For the dancer that's looking for more specialized attention at an affordable rate. You MUST register for the Saturday workshops to take part in the small group. If you have scheduling conflicts, please email kizombaseattle@gmail.com to confirm. Each of the 1.5 hour sessions will be limited to 10 people (5 couples). These sessions are designed for dancers who want to take their dancing to the next level, working in a small group with other dancers with comparable experience. You will receive individual attention from the instructor AND you will be able to learn with other dancers that share the same goals and similar experience. When you register for this option, you will be emailed a set of questions to help confirm and ascertain your level and goals so you can be grouped with the right people. Which Sunday Small Group Session? Ennuel is available for privates. Please contact kizombaseattle@gmail.com to schedule them. Space is limited so plan ahead. Privates are $125 an hour, not including any studio fees. Please note that payment should be made in cash. Classes, Workshops and Mini-Intensives are transferable and non-refundable. Please contact kizombaseattle@gmail.com for transfers . NOTE: For the Small Group Intensives, your substitute should be of the same level of dance and role as you. All transfers MUST be confirmed. According to the my grapevine, some cliques have been forming in our growing Kizomba Seattle Community and its making some people feel unwelcome. Back when our community consisted of less than 20 people, I could say confidently that I knew everyone that fell in love with Kizomba. Today, I'm happy to report that I don't and that's because our community has grown so much over the past few years. I can't even attend all the events that we have any more and I believe this is largely a good thing. When a community grows, the whole idea of "one big happy family" is hard to sustain without a regular presence of a "mom" or "dad" figure setting the tone so its is only natural that cliques start to form. a small group of people, with shared interests or other features in common, who spend time together and do not readily allow others to join them. The key part is "do not readily allow others to join them". I've been in and out of so many scenes and I totally get the clique thing. I've been on the side that feels unwelcome and I've been on the "cool kids" side and what I learned is that no matter what you try to do, someone will always feel unwelcome. In other words, there's no pleasing everyone. Everytime I start in a new dance or group activity, its easy to spot "that group": the cool kids. When I was learning how to swing dance, I always envied that group that was having so much fun in that corner of the dance floor, all chummy chummy with the instructors and DJs. I wanted to get to know those people and I wanted to be included. Sure, I felt like they didn't want to get to know me at all and sometimes I got discouraged but mostly, I just wanted to dance like them or dance so well that they had to take notice. So I focused on learning and getting better and getting to know the peer group I was learning with and in a few months time, I was being asked to dance by the "cool kids" and they started to take notice of me. In some cases, I became a cool kid myself. Here's the thing - you can't avoid the cliques: people will naturally gravitate to each other to form friendships and smaller groups will form within a larger community. You all know how hard it is to maintain relationships, especially as an adult with so many other things pulling and competing for your time. Most of the time, the folks in a clique just have so much fun with each other, they don't have time for other people. SO - what to do? I submit that if you are a newbie, you should try to flip things around and not make it about the clique but make it about you. Yup, YOU getting better, feeling good about your dancing and making new friends. It would be nice if there was always a welcome committee for new people [HINT HINT to some of our more established peeps and thanks to the ones that are consistently doing their best to welcome new people]. That being said, if you're new, and you feel a little left out, try something that will make you feel a little uncomfortable and observe the crowd to see who you could say "hi" to and make a new friend. Be open and smiling yourself: don't be the wall flower and stand in a corner with your hands crossed or head hunched over. Sway to the music and smile like you're having a good time (cuz you are) - it works. Someone will say "hi!" ITS REALLY NOT ABOUT YOU. The clique and its energy is about the people in that clique. People in cliques are usually really good friends that have a TON of fun with each other and so when they go out, they dance with each other, laugh with each other, talk together. Its not that they don't want to get to know you, its that they want to spend time with each other. So you can choose to feel like the one that's left out OR you can choose to be the next cool kid on the block. Flip the switch and change the perspective to one that favors you. One could argue that the cool kids should be putting something back into the community and welcoming new people into the fold. Sure - I get that and as a former cool kid myself, I try my best to do that when I can. The bottom line is that dance is about YOUR OWN personal enjoyment and expression. Part of that is who you choose to be with and dance with but most of it is about what YOU love about the dance and who you are. If you're enjoyment of dancing is limited to what other people think of you, then its not the best reason to dance. You have to dance for your own enjoyment and expression. What's that you say? *Insert name here* is teaching now?! Visiting instructors to Seattle have always commented about the unity they feel in the community here that they do not feel in other places that they have visited. They view our community as being more unified than most and lacking the in-fighting that they see and sometimes experience when they visit other communities. It's not like drama doesn't happen. There are disagreements, strong opinions that clash, all the normal things you would expect in a community filled with different kinds of people. These interactions are normal but they do not define or set the tone for what our community is. 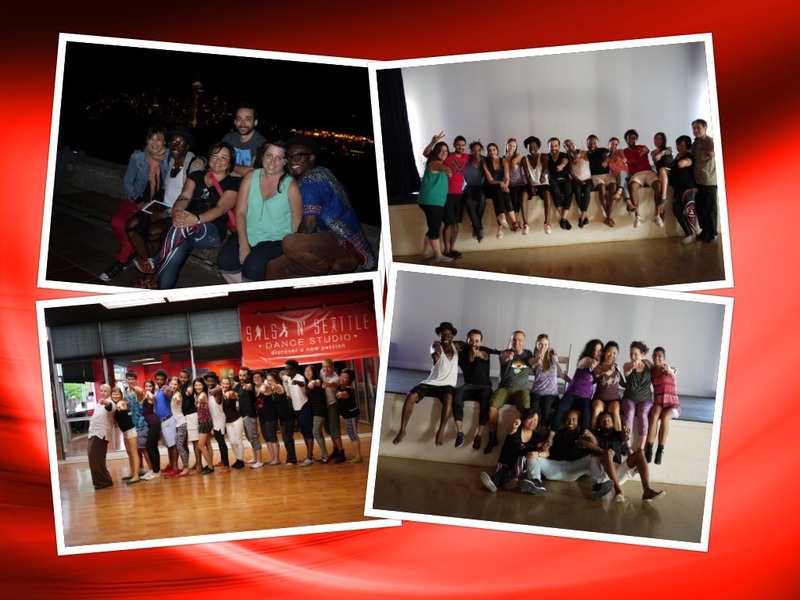 So why is the Kizomba Seattle community different? There is little or no back fighting or one-up'ing going on within our teaching community: we all know each other and get along. Sure, we have different opinions on things and different teaching styles and methods, but for the most part, there is very little dissension and unfriendly competition amongst us. I think this is important because it has an impact on the community itself: the community is then not divided into "camps" based on who their teacher is. I think this is state of cooperative competition is a result of the fact that all of us who are teaching "grew up" together as we learned to dance Kizomba/Semba. We learned together: with and from each other when it was just a budding scene. We also each took our own path to learning and continue to talk to each other and collaborate. l love it. I think its awesome. Lately tho, I've been hearing other people talk about so-and-so starting to teach and of course, the reaction and tone that I hear make it sound like their opinion is that this person isn't ready to teach. My own first reactions might be the same as I react with my judgement and personal opinion. Whatever the case, after my initial feelings are expressed, I always try to end with this: the more people there are to spread the love of the dance, the more the community will grow and that's a good thing. Sure, some will argue that so and so is not ready to teach or doesn't know enough to teach. Bottom line is there is nothing anyone can do to prevent someone else from teaching. What right do I (or anyone else) have to say "You should not teach." If people feel like they have something to offer as an instructor and would like to be paid for that time, why not? Sure, I have my opinions and thoughts based on my experiences and knowledge. So if you ask for my opinion and advice I'm happy to share it. You can argue that people who aren't qualified to teach are stealing from their student if they charge money for it. Here's what I believe: students will find who their best teacher is. There are so many factors to finding the right teacher and when you are spending your own money to pay for an activity that you are doing as your hobby or for fun, I'm pretty sure you'll invest in it wisely in the long run. A truly good teacher will stand out and the ones that aren't qualified will eventually have to step up or lose their student base. Rather than list reasons why someone shouldn't be teaching and/or pass judgement, I'll share my thoughts on what I think makes a good dance teacher. Gotta love what you do and it has to show. This is something all the teachers I respect and would always learn from have in common - they love what they do and I can feel it when they teach dance. They are students too. In order to teach someone how to do something, one must also be actively doing or practicing that which they are teaching. Great teachers also evolve with their students and learn from how their students learn. If you spend all your time telling someone what to do, something gets lost in your own development. They actively dance (or are involved in dance other than just teaching). I do think for dancing this is important. A teacher should be actively engaged in dancing whatever dance they teach not just as a teacher. Do you seem them out dancing? Performing? Engaged in the community? DJing? Its not just about the dance. I think great teachers take the time to learn about teaching itself, the music, the dance origins and context for the dance. I'm not saying that someone who doesn't know the history of Kizomba will be a bad teacher. I just think that its only natural to know more about what you love. Geek out on dance I could spend hours talking about dancing - the music, how to move, what makes a good dancer, what makes a good move, what makes a move work. What's the progression of how to teach things, what will make things easier to understand. Coach, Mentor, Cheerleader all in one. A truly great teacher is many things to different people. They know when to encourage, when to push, when to engage and when to let things simmer. Knows that its not about them. Great teachers will not make it about themselves or the other teachers. It's about the students and helping them grow and love themselves in the dance. Know their strengths and limitations. I think to teach you have to also know yourself pretty well. You shouldn't make things up about what you don't know and shouldn't be afraid to say when something is not your area of expertise. Its not Wrong I hear this a lot, "well, my teacher said it was wrong do to this". I think that this one is tricky because students can hear things out of context. A good instructor recognizes that there are different methods of executing a movement and will at least talk about what works for them and what they teach and recognize that there are other ways to teach the same material. So who does teach kizomba in Seattle? Here's a list and if you teach and are not on it let me know and I'd be happy to add you to the list. My previous post about balance focused on stillness and your own balance. This one focuses about balance in the partnership while you are dancing with your partner. While dancing, leads and follows are each responsible for their own balance in the dance. To truly connect with your partner while dancing, one must also start to develop an awareness of your partner's balance as well. This second level of balance awareness can take dancing to the new heights. The added awareness allows you the space to express yourself as you dance in unison with another person whether you are a lead or a follow. Balance in motion is tied to awareness of your partner as well as the forces at work when you move together. For example, a follow, no matter what size, can easily throw a lead off balance if either party is not aware of their balance while moving. Follows have the last action in any movement since they are finishing what the lead has suggested. This means they carry with them some force from acceleration and momentum that if they do not control by maintaining their own balance OR if the lead does not prepare for, can easily cause the lead to go off balance. The need to be aware and in control are particularly important with movements that involve rotation and speed (quicker movement than usual). The reason we don't see more spills in kizomba is that the speed and distances traveled by the dancers are slower and smaller and so are easier to control. In the event there's a balance challenge, leads and follows can still compensate for momentary lapses of balance. The result of the compensation is usually some sacrifice of grace, smoothness and connection if things don't go quite as planned. Building awareness of your own balance and your partners' comes with practice and experience. When I start to teach kizomba, I stress that despite the close connection, the lead and the follow each are responsible for their own balance. When you start to be comfortable in that, you can start to pay attention to your partner's balance as well. When does the weight shift occur? When is the balance distributed between both legs? What causes my partner to step? Building this awareness allows the lead to then play with their connection in a different way: to slide or life or pivot their follow as an interruption to the base walk. 1) Slow Motion Walking: can be done along then in partnership. Alone to work on your own balance and control while in partnership to learn to listed to when the weight shift occurs. 2) Leading a Step Without taking the Step: Can you move your follow to take a step while you don't? Are you aware of what foot your follow is on and when you can sync up with opposite feet or same feet? Start with walking together and pay attention to when your partner has committed to step. See if you can lead in such a way that you make your follow step without you (the lead) actually taking a step. Do this while the follow is walking forward and backward. Kizomba Seattle has been around for almost 5 years now. Every time we have a visiting instructor come to teach and dance with us, they tell me that they love the community we have here because it embodies the spirit of kizomba. When I embarked on this path, it was simply for the love the music and the dance. It touched me in a way that no other dance had and I really just wanted more people to dance with. 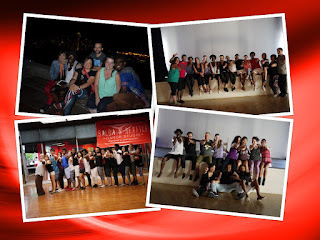 This past weekend we were privileged to have Mandela with us to teach us about Semba, Kizomba and Afrohouse. Despite his catastrophic English (he says that his english is "catastrophe!") there was no loss in communicating the spirit of the dance. We had a smaller group than normal attend our workshops and I'm pretty sure everyone left with something new and better than what they started with. Mandela was talking about the feeling that goes into the dance and how technique can only take you so far. We had just finished learning a pattern and he wanted the group to just dance so he could observe us and walk around to provide feedback to the couples that were dancing. After playing 2 semba songs that were playful and a bit faster paced, he put on a kizomba song that was gentle and mellow and the whole group's energy went from bright orange/red to mellow blue/grey. It felt like everyone took a deep breathe in with a long exhale to just sink into the music. I was watching on the side as Mandela was observing the group and he was so moved. I think he would have given a shout of joy right at that moment if not for the quiet quality of the music. I wish I could have taken a picture. What he did was stop the music and walk to the center of the group and explain how, in all the years of teaching groups, he was never more moved by what our whole group just did. To see how everyone responded to the change in music moved him. As for me, I just wanted to shout and say "Go Kizomba Seattle!!!" Many of the people in class have learned with me, from me and all have grown in the dance over the last few years. I could not have been more proud or happy to hear us all be acknowledged by Mandela. I will remember that moment for a long, long, time. Mandela: Thank you for your energy, your time and your generosity. It was such a pleasure to have you here in Seattle and even tho I don't speak Portuguese or Spanish and can passably understand French, you are proof 100x over that dance is an international language. THANK YOU for giving all of us your love sharing yourself and your energy. Ana: Thank you for hosting our guest and helping with translation and logistics. It was very helpful to have someone who could speak Portugese be part of the experience and especially too because you and Mandela had already met before. Jessica, Mario and Landy: My other translators and general help: you guys rock! Thanks for being flexible too and working with the little adjustments during the weekend. Katie: Thank you for your help over the weekend and opening your home to us to end the weekend. I think it was the best possible way for things to end. Kizomba more than anything is about family and I'm so grateful and proud of our family, with all its diversity. OBRIGADO PELO EXCELENTE FIM DE SEMANA!! A FAMILIA DA KIZOMBA DE VILA DO CONDE E PÓVOA DE VARZIM ESTA A VOSSA ESPERA!!!! MANDELA MANDELA AKADEMIA DE KIZOMBA. Thank you for the excellent weekend!! The Kizomba family from Vila do Conde e Povoa do Varzim* will be waiting for you. Mandela Mandela akademia of kizomba. *these are 2 small cities in Portugal where Mandela lives. If anything comes up at the last minute of If I missed anything HOLA!! Things are definitely hot here in Seattle this July. Its a new month and we have a ton of great stuff in the pipe, not to mention some fun impromptu stuff that will likely be going on through the summer here. Make sure to join our Kizomba Seattle facebook group for the impromptu stuff. July 17 - 3rd Saturday Late Night at West Hall with DJ Samir 11p - 1:30a AND we'll be welcoming Tania Mendonca as well !! If anything comes up at the last minute - this group page feed will have the latest. If I missed anything HOLLA!! I've been presented with a chance - its a long shot and I'm pressed for time so I'm hoping you can help. I need 250 votes by June 19 to make it to the evaluation round to be considered for the Mission Main Street Grant by Chase which will be awarded in September. Feel free to share with others and don't wait, deadline is June 19. Thanks in advance! My business is teaching partner dance (Kizomba with some Bachata and Salsa) and producing dance and social event for people to learn about Kizomba and connect with a larger community that also enjoys learning, dancing, music and culture. Dancing allowed me to give form to expressing joy through movement with another person and allowed me to participate and give back in a warm and welcoming community so I want to share and facilitate that experience for others. I'm starting with Kizomba and hoping to grow it past this dance into other dances and other activities that I love: art and cooking. Can you imagine a space where you can do all three? Geek out on whatever you wish or just be a newbie experiencing something for the first time. Continue to bring the best instructors here to Seattle for Kizomba and Semba through weekend workshops and social dancing. Develop a new curriculum of classes that are focused on musicality to help dancers that have grasped the basics to further their dance. EX: I want to try to find a live band to teach with to help dancers hear elements in the music better. Develop other programs that involve teaching dance to help with building confidence and another to help build intimacy in relationships. Bring together Kizomba teachers from all over the US to cooperatively discuss how to teach better, how to build community and how to enable cost effective exchange between communities and have this be an annual or bi-annual event. Expand this to different dance eventually. Develop a Travel and Exchange Program to help bring dancers closer to the cultural and musical context of the dance. Work with the Bachata Seattle team on the same programs to expand the Bachata community. Find a space or work cooperatively with other studios and businesses to promote the art and cooking aspect of my Creative Learning Lab. Find business partners with strengths in marketing and sales to help me grow my market reach and monetize my ideas to create a sustainable business. I want to create a Creative Learning Lab that allows people a fun environment to learn, explore and discover themselves with others. I believe that social partner dancing is a key activity that facilitates learning and personal growth and also builds community so I want to teach partner dancing in ways that allow this learning to happen. I also want to create a community that is welcoming and self-sustaining where its members pay it forward to help keep the community thriving. I also want to foster cooperative competition with others like myself who want to to grow through their passions. We are happy to welcome Jamba and Adoree to Seattle May 16-17, 2015! This will be their first visit to Seattle so let's give them a warm welcome. This couple hails from Prague and bring with them lots of energy, playfulness and passion. The weekend also coincides with 3rd Saturday Late Night Kizomba in West Hall at the Century Ballroom to make this a mini-kizomba-semba treat. 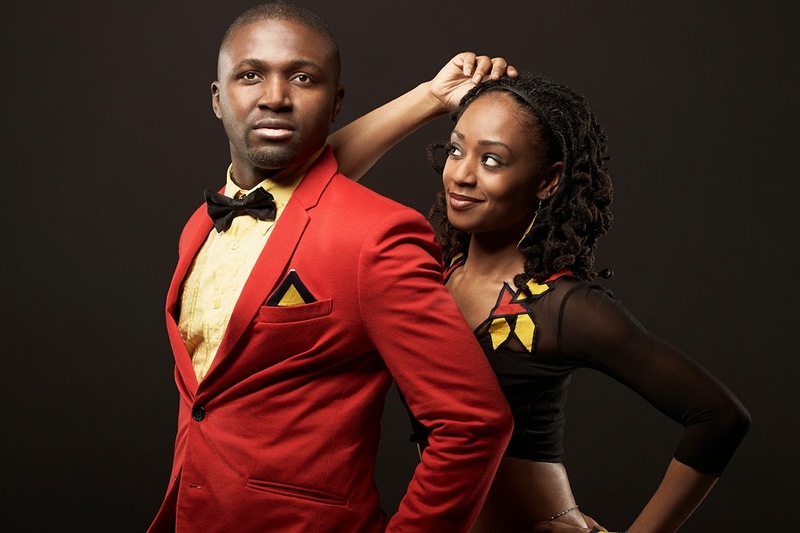 Come learn from, dance with and meet this creative and fun couple. 5:00 - 5:30 Wrap-up, Pictures, etc. For the dancer that's looking for more specialized attention at an affordable rate. These 1.5 hour sessions that will be limited to 10 people. These sessions are designed for dancers who want to take their dancing to the next level. Not only will you be able to get more individual attention from the instructor, you will also be in a class with other dancers that share the same goals. ONLINE REGISTRATION AND PAYMENT is closed for now. Jamba and Adoree are also available for privates. Please contact kizombaseattle@gmail.com to schedule them. Space is limited so plan ahead. Classes, Workshops and Mini-Intensives are transferable and non-refundable. Please contact kizombaseattle@gmail.com to notify me of the transfer. Since the Mini-Intensives are based on your level of dancing and similar goals with your fellow attendees, your substitute should be of the same level of dance and role as you. The transfer is subject to final confirmation after you notify me of the request. It never ceases to amaze me how the energy of early discovery and building a new community can be so different and exhilarating compared to the normal high that comes from just dancing and teaching. There's a freshness and excitement of being on the leading edge that makes it even more fun than it already is. I have been blessed to be part of so many beginnings that go beyond teaching someone to take their first steps when learning kizomba. I've been lucky to be part of 1st and 2nd waves of kizomba in places like: Seattle, Vancouver, Mexico City, Nicaragua and now Portland. Portland is a late bloomer. When Kizomba Seattle started ramping up a few years ago, we had visitors from Portland and Vancouver (BC) coming to join us for our weekend workshops and dances. While our scene here in Seattle developed at a steady pace, the folks up north really fell in love with it and they have successfully integrated it with other dances in the form of SBK (Salsa Bachata Kizomba) nights and Kizouka (Kizomba and Zouk nights). There are studios teaching regular classes and DJ's on the scene to help keep the party going. For Portland this was not the case. A handful of dancers would journey to Seattle but there never seemed to be a lot of momentum as far as creating a scene of their own... until now. Thanks to some of the early pioneers there is Facebook page (Kizomba Love Portland) a practica that's monthly (once or twice) and studios that are hosting workshops to teach kizomba. I was privileged enough to be invited along with Dennis and Oriel for a mini-Valentine's weekend hosted by Dance with Joy. Its always a blast to teach and even more so when people are just soaking up everything to the point that one can see a difference in the way people dance from one day to the next. These workshop weekends are wonderful because I get to spend more than just an hour with the students that come: I get to spend 3-4 hours and even more over the course of the weekend. I get to dance with everyone and feel the difference in their dancing from day 1 to day 2. Last but not least, I get to experience the generosity and welcome from the folks that hosted the workshops and hosted my stay in Portland. This is also the first collaboration that involved travelling outside Seattle with fellow instructors and friends from Seattle. I am so glad we were able to agree to do this because so often the environment for teachers is more competitive. I feel sometimes that we don't give each other props enough because we know of the financial risks to the event producers so we care more about getting the gig for ourselves. I'm thankful to Rachel Lidskog for being so open and excited by the idea of having all of there for a mini-weekend of Kizomba. It was great to talk to some of the first dancers that came to learn with us in Seattle and the newer ones that have added their love of the dance as fuel to get things going. I'm looking forward to seeing what comes next and to be a part of it as much as I can. Thanks to everyone that came and supported the event (including the Seattlelites that joined us for the road trip!). Thanks again to Rachel for taking the chance and bringing us there to teach. Thanks to John and Cynthia, our lovely hosts, who opened their home to us and fed us and gave us a home away from home for the weekend. I've been vacationing with family over the Christmas and New Year and that usually means no dancing and lots of eating. One day I'll bring more Kizomba to the Philippines along with Bachata ... but that's for another day. As the 1st of January comes to an end, its time to reflect on what happened in 2014 and what to look forward to in January. Let's welcome January with a bang! Sep 4 - 8 Dance Festival at the Center of the Universe where Miguel and Susanna, Ivo and Shani, Frances and Galine taught kizomba as part of the Zouk festival. 2015 is already off to a great start, let's keep our community growing strong and sweet! I'll reserve the excitement of who's coming to visit in another post but let's just say, I already have something brewing for April, May and October.